This article contains facts and information about the life and times of the famous Native American Indian chief known as Manuelito. Who was Manuelito and why was this Native Indian chief famous? Summary: Manuelito (c.1818 - 1893) was a famous chief and war leader of the Navajo tribe. He was a leading figure in the resistance to military intrusion, the white settlement on Navajo tribal land and the forced relocation of his people. Manuelito joined his people on the 350-mile trail of death known as the infamous "Long Walk of the Navajo" to Bosque Redondo Reservation. The following fact sheet contains interesting facts, background history and information about the life of Manuelito and the events in history that led to his fame as a great Native American Indian leader. 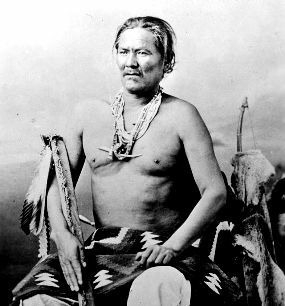 Manuelito (c.1818 - 1893) was an important Navajo chief who led his people against the white encroachment on Navajo territory. The overwhelming forces of the US army led to his surrender and the forced relocation and terrible journey to the to Bosque Redondo Reservation known as the "Long Walk" . The US army, directed by General James H. Carleton, conducted a devastating scorched-earth campaign against the Navajo. Colonel Christopher "Kit" Carson was responsible for rounding up the Navajo tribe and organizing what would become known as the "Long Walk" to the Bosque Redondo reservation. These are the facts about the "Long Walk"
The following Manuelito timeline charts the life of this famous Navajo chief and his fight to prevent the Navajo Native Indians move to the Bosque Redondo reservation. 1835: The Battle of Washington Pass. Seventeen year old Manuelito took part in the conflict led by Chief Narbona that defeated a large raiding force led by Captain Blas de Hinojos at what today is called Narbona Pass. 1855: Manuelito succeeded Sarcillos Largos as principal chief of the Navajo and initially tried to avoid conflict with the US military. On July 18, 1855 he signed the Meriwether Treaty. For additional facts and information refer to the legend and the Story of Manuelito. Discover the vast selection of pictures on the subject of the tribes of Famous Native Americans such as Manuelito. The pictures show the clothing, war paint, weapons and decorations of various Native Indian tribes, such as the Navajo tribe of Manuelito, that can be used as a really useful educational resource for kids and children of all ages studying famous Native Americans such as Manuelito. We hope you enjoy watching the video - just click and play - a great educational resource for kids.